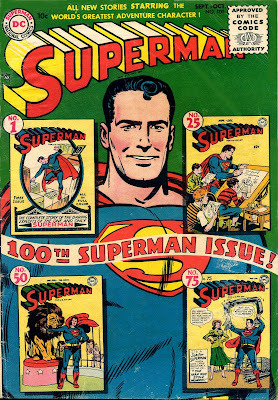 As Mort Weisinger took over the reins of the Superman family of magazines, he and his writers set about developing the Superman legend as it would come to be known during the Silver Age of comics. In the stories devoted to Kal-El as an adult, this took the form of the Superman family, with Kandor, Brainiac, the Fortress of Solitude, etc. 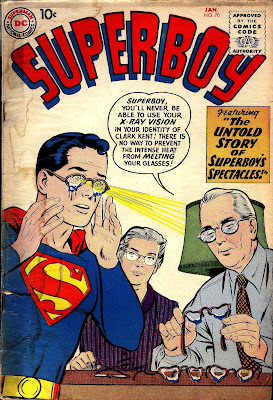 In the Superboy stories, the focus was more on tales like this one, where we learned how the Lad of Steel learned to overcome some of the limitations and problems that arose from his powers. 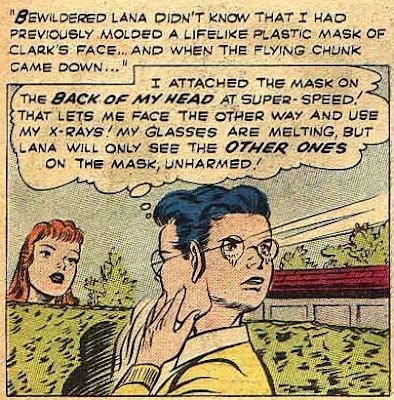 Now the only thing left is to quell Lana's suspicions about the earlier incident. 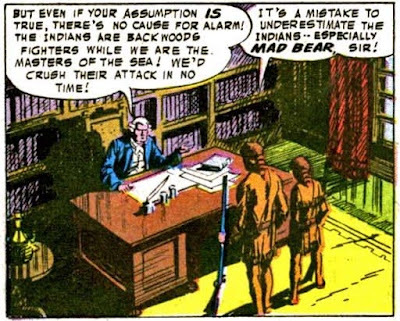 Silly story, undeniably, and yet it does help to establish a reasonably important point in the Silver Age Superboy and Superman. There were several other "Untold Tales" and I will discuss them in future posts. 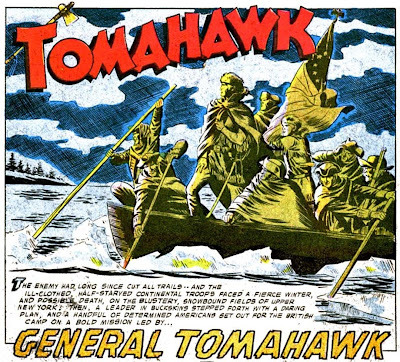 Tomahawk was a long-running DC series featuring the adventures of one Thomas A. Hawk during the Revolutionary War era. American culture of the 1950s was dominated by the Western. Stars such as Jimmy Stewart and John Wayne rode tall in the saddle for much of the decade. Baseball historian Bill James once speculated that the reason TV shows like the Beverly Hillbillies and Green Acres were so popular in the 1960s is that the "hicks" they featured were a dying breed in America. I suspect much the same can be said of the Westerns in the 1950s; by then the Old West was gone, and we missed it. 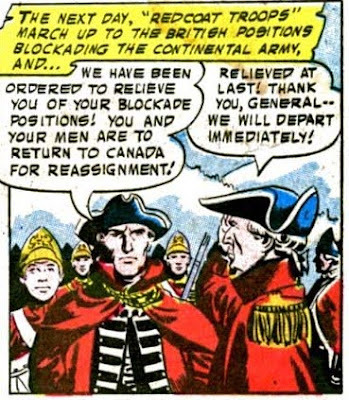 The Western was also enormously popular in the comic books of the time. 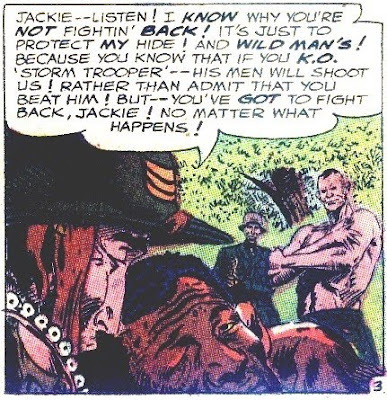 DC published almost 300 comics with a Western theme during the decade, including All-Star Western, Hopalong Cassidy, Dale Evans, and Western Comics. 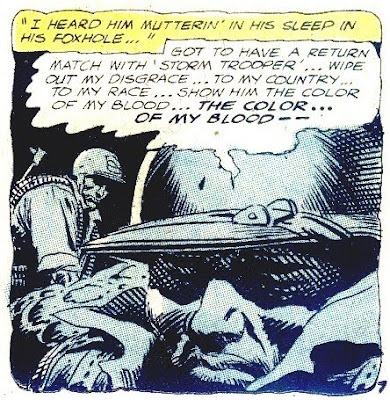 In addition, Western characters appeared in other magazines, including Pow-Wow Smith (in Detective) and the Vigilante (in Action). 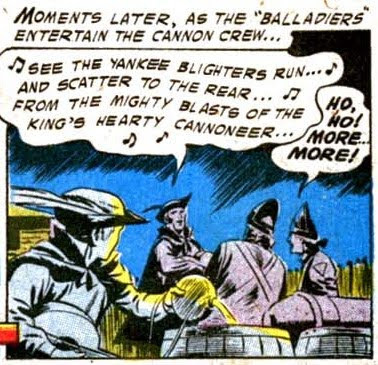 These comics were so popular that even some of the horses got their own books; the Lone Ranger's Silver had 37 issues, while Roy Rogers' Trigger lasted for 17. Comments: An entertaining and amusing story, and Brown's artwork is nothing short of sensational. Tomahawk persuades the captain of a whaling vessel to take to sea to try to stop the raid on the lighthouse, but they are too late. In order to save the British fleet, they set fire to the whaler, alerting the English ships to the danger of the nearby shoals. 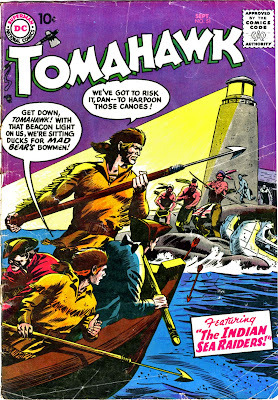 Then Tomahawk and his men strand the Indians on the lighthouse island by harpooning their canoes as shown on the cover. 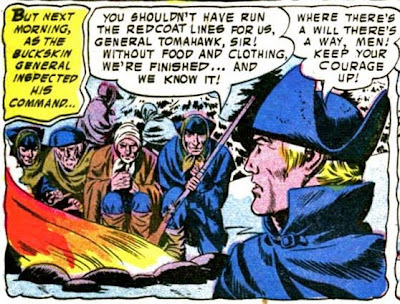 Note: This story appears to take place prior to the Revolution, as Tomahawk and the British cooperate against the Indians. Comments: A fairly pedestrian story lent some luster by Fred Ray's strong artwork. In the third story, a traveling zoo is attacked by a band of Cherokee Indians, and the animals (including a panther, a lion, a water buffalo and a rhino) are released into the wilds of America. Tomahawk and Dan help the zoo-keeper recover the animals and defeat the Cherokee. Overall the artwork and stories were very good, but some of the details are a little shaky geographically. 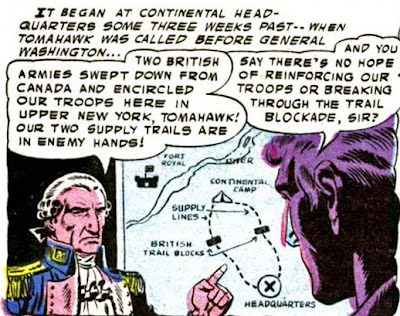 For example, in the second story, Tomahawk's renegade Indians are supposedly from the Chinook tribe, which was located in the Pacific Northwest, nowhere near Boston. And how far afield were the Cherokee, given that the other stories in this issue take place in New York/New England? The later Tomahawk series (after Jack Schiff took over) was more the monster of the month club, but this issue shows that the earlier issues provided some excellent entertainment value. 1. Who came from the planet Wexr II? 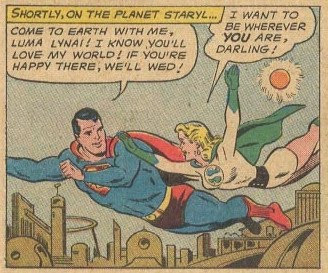 The Superboy (and later Superman) Revenge Squad originated on that planet. 2. Who came from the planet Staryl? 3. 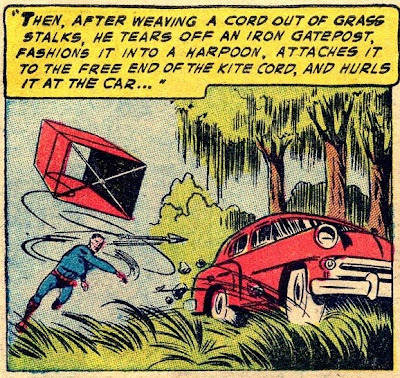 What was the name of the hover-car that Jor-El invented? Jor-El invented the Jor-El (the guy wasn't too vain). I presume it was a cousin of Jor's who invented the Eds-El. 4. Who lived on the planet Htrae? Htrae was the Bizarro world. 5. Why was Jax-Ur sentenced to the Phantom Zone? Jax-Ur destroyed an inhabited moon of Krypton. Jim got #2, #4, and #5 right. Michael Rebain got all five on the button. David apparently knew all five and contributed the additional information that the inhabited moon was named Wegthor. Jacque Nodell also got all five correct. Great job by all! You may recall that a Little Orphan Annie decoder pin story became a key plot element in the movie, The Christmas Story. 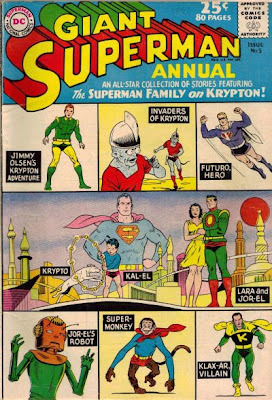 This summer we will publish a giant Superman annual featuring stories of the planet Krypton. In this one, the alphabet is offset by 5 letters, so that F is A, G is B, etc. 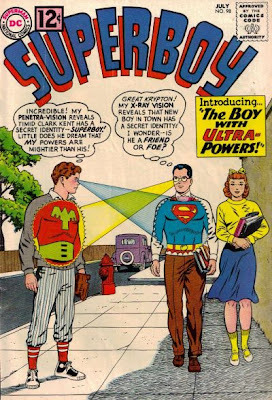 Ultra-Boy is the newest member of the Legion of Super-Heroes. See the July issue of Superboy. The messages were not always advertisements of coming attractions; they were often inspirational statements about doing your schoolwork, or getting plenty of fresh air and exercise. For example, from Superman #68 comes this tip: "Keep healthy, cultivate a sense of humor, and learn to see yourself as others see you." As far as I can tell, the planets mentioned at the beginning of the code have no real meaning. Update: Snard in the comments points to this scan of the actual code key. Anonymous notes that the planets correspond to the numbers (Mercury 1, Venus 2, Mars 3) in terms of their ranking in terms of proximity to the sun, with the rather odd exception that Earth is omitted and Krypton becomes number 9. 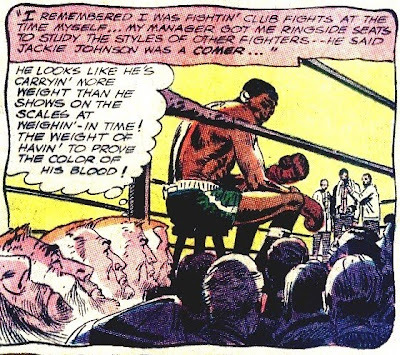 This is a thinly-veiled retelling of the Joe Louis-Max Schmeling rivalry; more on this at the end of the post. Comments: Wow! What a terrific story! 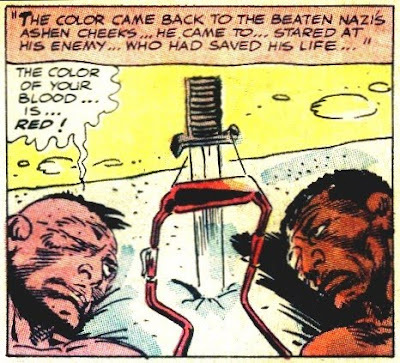 Kudos to Robert Kanigher and Joe Kubert for providing what must be considered one of the Silver Age's finest tales. Joe Louis and Max Schmeling. In 1936, Joe Louis looked unstoppable at 23-0. Max Schmeling was a former heavyweight champion, but he had won his title via a disqualification of when Jack Sharkey hit him with a low blow. So Schmeling was considered just a tune-up before Louis boxed for the championship. 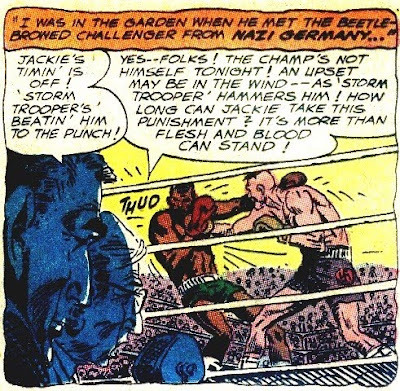 But Schmeling had trained hard for the fight and noticed a flaw in Louis' style which he was able to exploit in knocking out the Brown Bomber at Yankee Stadium in the 12th round. Schmeling did not relish being the focus of such propaganda. He was not a member of the Nazi Party and – although admittedly proud of his German nationality – denied the Nazi claims of racial superiority: "I am a fighter, not a politician. I am no superman in any way." Schmeling had a Jewish manager, Joe Jacobs, with whom he refused to part despite significant pressure, and, in a dangerous political gamble, refused the "Dagger of Honor" award offered by Adolf Hitler. In fact, Schmeling had been urged by his friend and legenday ex-champion Jack Dempsey to defect and declare American citizenship. Nevertheless, the Nazi regime exploited Schmeling in its propaganda efforts, and took careful steps to at least ensure Schmeling's nominal compliance. Schmeling's wife and mother were kept from traveling with him to avoid the chances of defection. Schmeling's entourage also included an official Nazi Party publicist. The publicist not only controlled any possible contrarian remarks by Schmeling, but also issued statements that a black man could not defeat Schmeling, and that Schmeling's purse from the fight would be used to build more German tanks. Both Louis and Schmeling did serve in their respective military forces in World War II, although of course they did not meet during those years, on the battlefield or elsewhere. After the war, they became close friends, with Schmeling serving as a pallbearer at Louis' funeral in 1981. Fantastic Four Fridays: Apes on the Moon! I'm skipping ahead a few issues to get in a post for "Ape Week" as suggested by Silver Age Gold, although I will go back and do issues 11 and 12 in the next two weeks. Note that although this story features apes prominently, they do not appear on the cover. The latter incident refers to the famed Tunguska event of 1908, although the current theory is that it was a comet that hit the earth, and not a meteor. 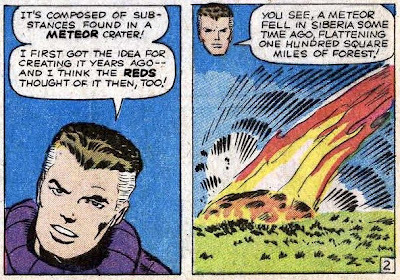 Reed traveled to Meteor Crater in Arizona and obtained a bit of the meteor's fragments, which contained his super-fuel. Reed resolves to make the trip alone, but you know how that idea went, and eventually he had to agree to take the whole team. He also has a babboon and an orangutan on his team. 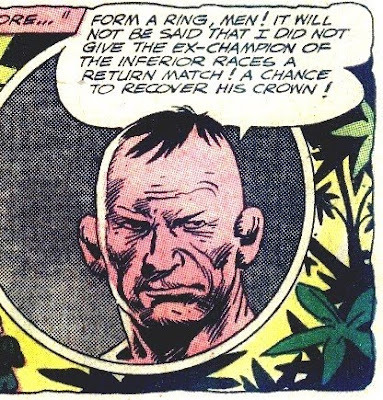 Kragoff knows that the FF derived their powers from cosmic radiation, and thus he intends to gain powers from his trip to the moon. The two missions blast off simultaneously. The gorilla gains super-strength and the orangutan has magnetic powers, while the baboon can mimic anything (including inanimate objects). 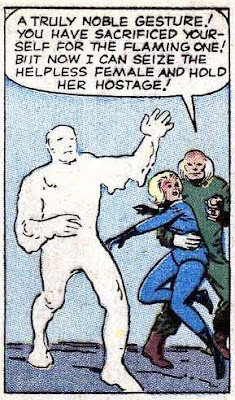 The Torch, who has flown over to inspect the communist ship (using a special suit that provides oxygen), observes the human/ape crew and their new powers. The FF land in the "mysterious blue area" of the moon. This turns out to be the remnants of some past civilization, although there is a newer crystal dwelling that seems inhabited. It also conveniently has a breathable atmosphere, meaning that the FF won't have to wear bulky spacesuits. He explains that his home world is one vast computer, and that other Watchers such as he are spread throughout the galaxy, recording information (and presumably sending it back to the computer). They reportedly only watch, and never interfere, although subsequent appearances by the Watcher raise questions on that score. 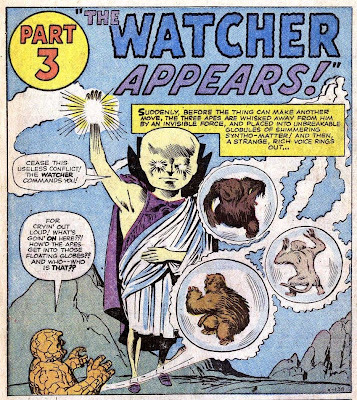 Since the FF and the Red Ghost and his apes are determined to battle, the Watcher sends them to another area where they will not involve his residence. Kragoff takes off with Sue. 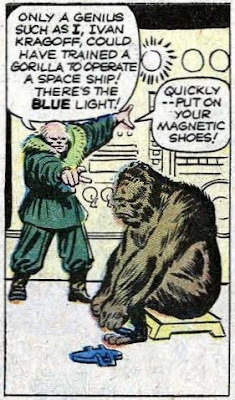 We also learn that perhaps his and the apes' powers are greater than those of the FF because they did not try to shield themselves from the cosmic radiation, and therefore were exposed to it for longer. 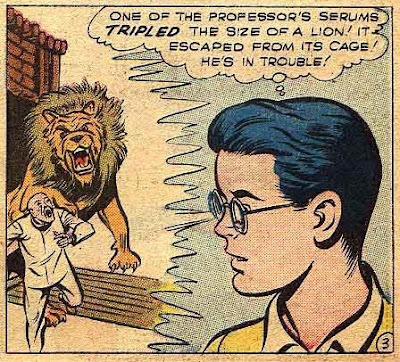 Reed decides he will have to use brainpower and stays behind to examine the scientific equipment while Ben and Johnny attempt a frontal attack. 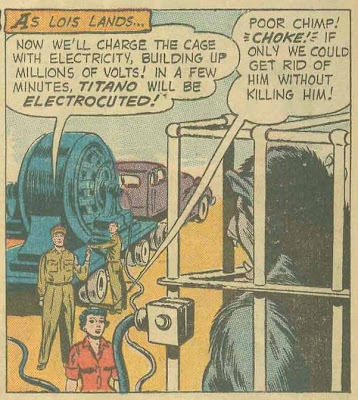 Meanwhile, Sue has freed the apes from the prison where the Red Ghost is keeping them when they are not in use. Comments: A highly entertaining story. 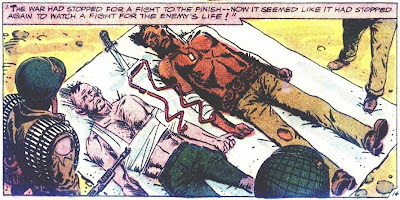 For the most part the FF stayed away from battling the communists, unlike some of the other Marvel characters (especially Iron Man). 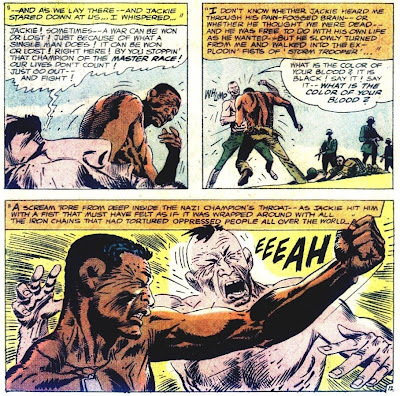 The ending is well-seeded with earlier scenes of Kragoff's brutality towards his apes. That one wins a booby prize for being one of the covers that give away the ending to the story; I talked about a Flash issue that did the same a few years back. 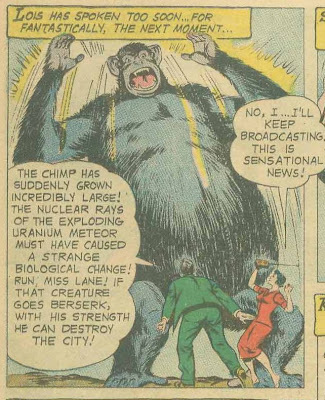 Incidentally, this post was inspired by Silver Age Gold's "Ape-ril in January" suggestion. A pair of pie-throwing comedians accidentally hit Toto, and Lois wins his permanent affection by wiping off the filling from his back. 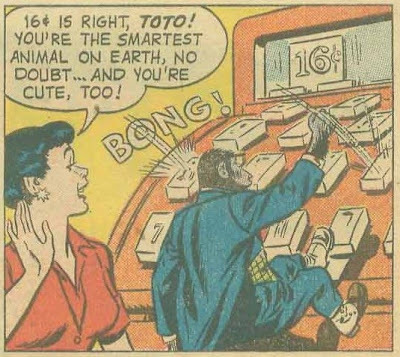 His trainer alerts Lois to a real scoop; Toto is going to shot into space on a rocket as a "publicity stunt". Of course, this was at the time (1959) when manned space flight had not yet been accomplished (Cosmonaut Yuri Gagarin was the first, in 1961). Several monkeys were shot into space by the US around this time, including a South American squirrel monkey named Gordo in late 1958, so the story was pretty topical. 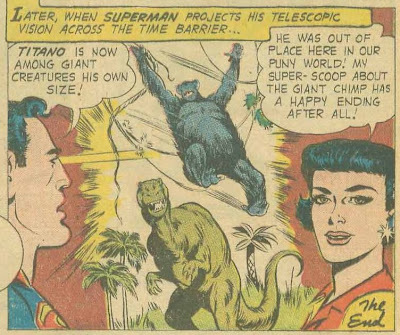 Because of his huge size, Lois renames him Titano. 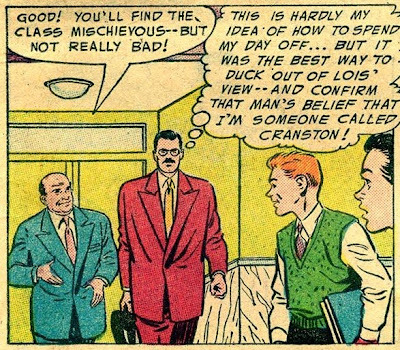 He grabs Lois, making her fear for her life. 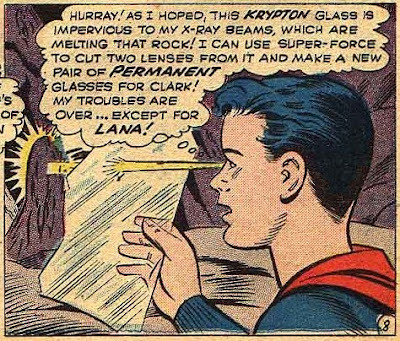 She calls over the radio for help from Superman, but when he arrives they learn that Titano now has kryptonite vision. That last scene is something of a swipe from the movie King Kong, where Kong and the T-Rex battle it out. 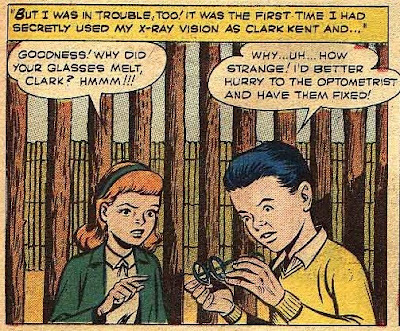 Note as well that this time-travel vision is one of Superman's "superpowers that time forgot" as Mark Engblom put it. He spots a giant ape, and is momentarily confused, until he realizes that it's his old sparring partner, Titano. 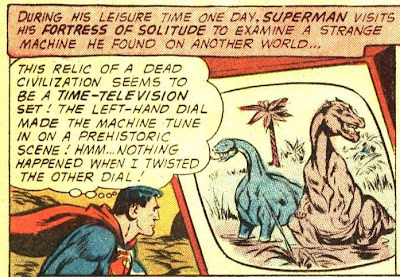 Unfortunately, with his trademark carelessness in handling alien objects, Supes failed to realize that the "time-television set" was actually a time-transporter, and it brings the chimp back to 1960. 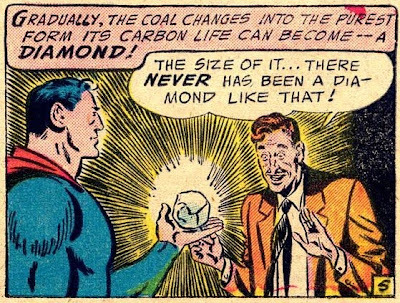 Supes had invented that about a year before in Action #249. 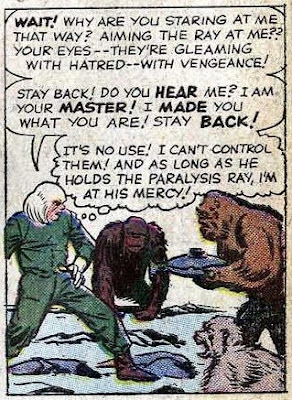 But there is a complication; Titano has kidnapped Lois and so he can't kayo the ape without risking harm to her. 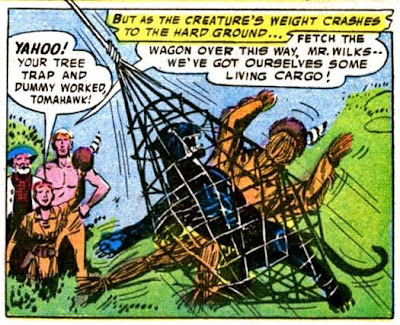 He notices that Titano seems interested in large, round objects; he grabs a hot-air balloon and then a bathysphere, but then discards them in frustration. What is he looking for? Superman flies into the past and finds giant coconuts where Titano was when he first spied him on the time-transporter. He returns to the present and drops the coconuts nearby. 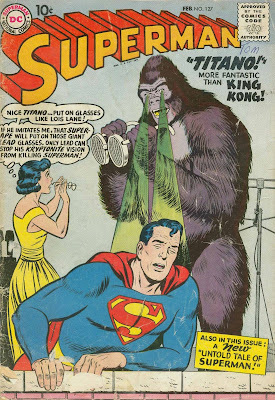 While the ape enjoys his meal, Superman saves Lois, then knocks out Titano and returns him to the prehistoric Earth. Titano reappeared many more times in the Silver Age and even afterward; arguably he was a part of the Superman Family. There was even a Bizarro Titano. I believe this is the first issue to celebrate a "hundred" milestone; Batman #100 followed a similar pattern several months later. 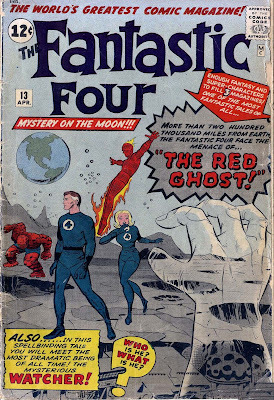 As the Silver Age wore on these "anniversary" issues became more common, with Flash #200 sprinkling "200" signs everywhere, and Fantastic Four #100 featuring the return of just about every villain the FF had faced in their prior 99 issues. 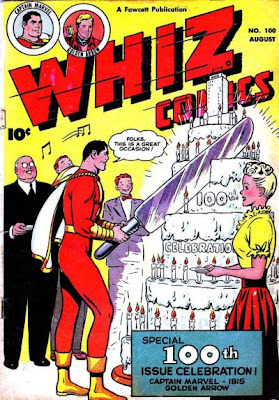 Although actually even though this was Whiz #100, it was actually only the 99th issue, as Whiz started with #2. Captain Marvel Adventures and Captain Marvel, Jr., also featured 100th issue covers. 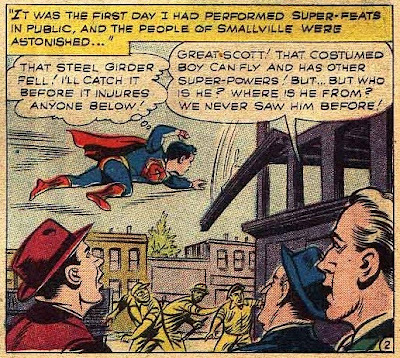 The opening story is The Toy Superman Contest, featuring small Superman dolls that can perform stunts just like the Man of Steel. Since a portion of the proceeds are going to charity, and as the dolls appear to be harmless, Superman agrees to judge a contest where the winner is supposed to come up with the cleverest feat that Superman can perform. There are rumors that the fix was in, and the kids drop the Superman toy figure in protest. 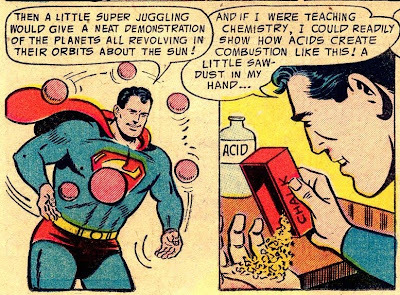 Why did Superman make such a bizarre choice? Well, the explanation is a little complicated. 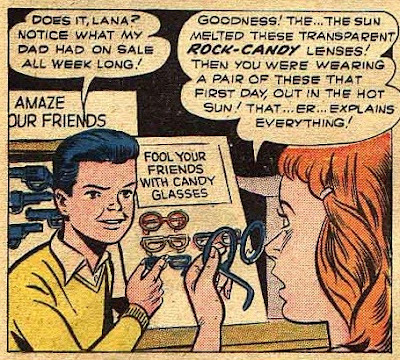 There was this crook who was hiding out in the waterfront district, but he had wired booby traps in innocent homes nearby that the heat of Superman's X-ray vision would explode, preventing Supes from looking for him that way. 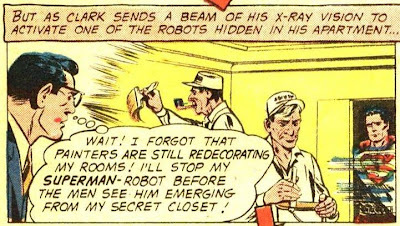 Harry had placed a bit of asbestos nearby to prevent the Superman robot from causing an explosion in the chemical factory. 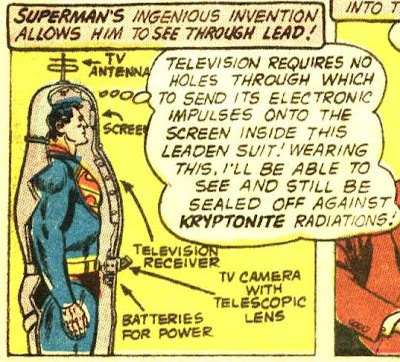 Similarly, Superman uses asbestos-treated eyeglasses to prevent the heat of his X-ray vision from exploding the bombs the crook has placed, and is able to capture him. Comments: An entertaining story with some humor, possibly inspired by The Blackboard Jungle, which came out earlier that year, although of course the kids in this story are Boy Scouts compared to Vic Morrow and his gang. The last story is The Clue from Krypton. 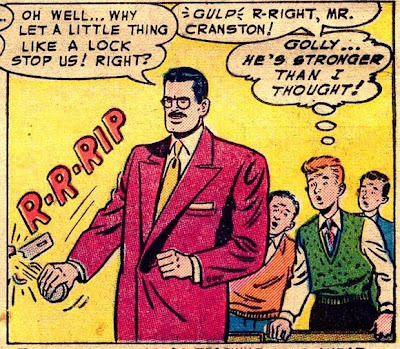 Clark is promised a scoop if he visits a man. 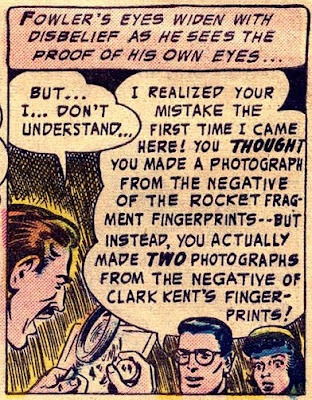 When he does, the man says that he knows Clark is actually Superman. He gave himself away in an autobiography he wrote. The story then goes into a flashback sequence showing how Jor-El warned of the destruction of Krypton and sent his son to Earth. 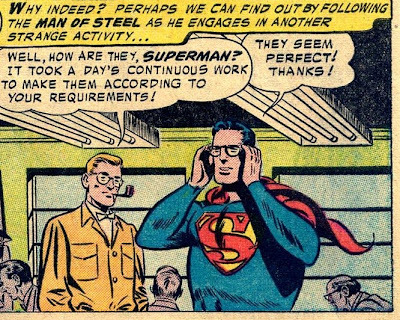 Of course, this is a relatively painless retelling of Superman's origin story. 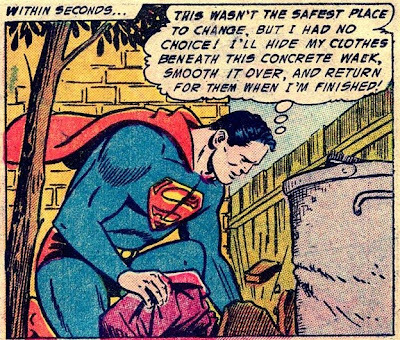 The man reveals that he discovered a small fragment of Superman's rocket that contained the baby's fingerprints. He compared them to some boys that grew up in Smallville and later moved to Metropolis, which was how he identified Kent. He wants an oil well and the world's largest diamond to keep the secret. Comments: This story is a different way of retelling the Superman origin. I found it amusing that the crook would have gotten away with his crime had he not reneged on his promise to give Superman back the fragment of the rocket with his prints on it. Guest Post: More Jack Schiff "Recycling"